Te Kura, formerly known as The Correspondence School, is a national school that provides distance learning programmes for students from early childhood to Year 13 in New Zealand. 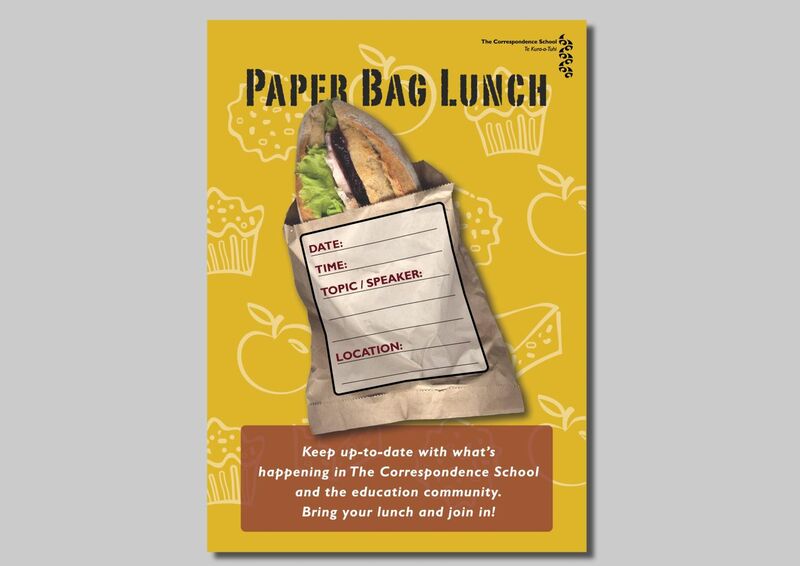 I was hired by the correspondence school to illustrate and design a poster for ‘Paper Bag Lunch’ an internal staff lunch meeting. Brief: To illustrate and design a poster for an internal staff lunch meeting called ‘Paper Bag Lunch’. The poster was going to laminated and designed to be reused with a designated area on the poster to write and update the details for each meeting, the lined area on the paper bag was the area that the meeting details would be added. A modern poster design with a mustard background with illustrated food texture pattern with apples, muffins and biscuits. A clear-cut image of a filled roll was sitting on the top of the background with the information text for the meeting on the paper bag.